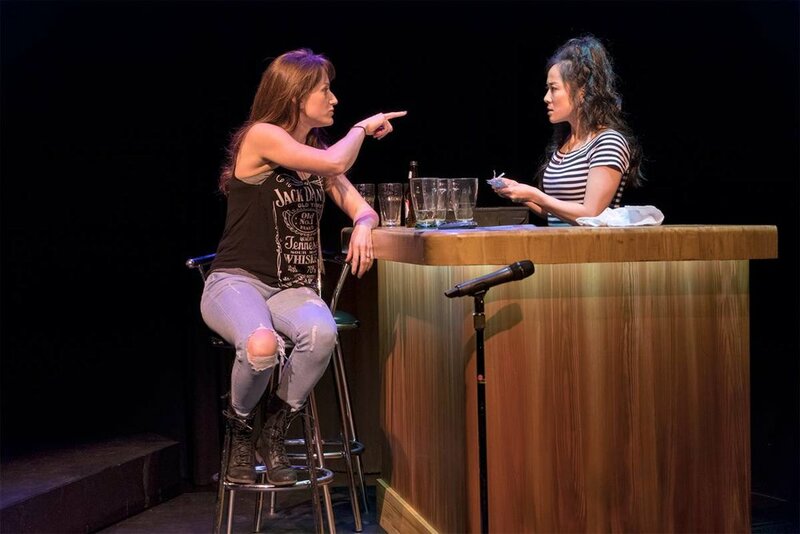 January-March: "Yo, Mama... We Just Chillin"
Meghan Gardiner and Agnes Tong in Diane Brown's March 2018 production of Catherine Léger's I Lost My Husband! (Ruby Slippers Theatre and Gateway Theatre). Costumes by Hannah Case; set and lighting by John Webber; photo by David Cooper. My longtime partner in life, Jovanni Sy, and I took a self-directed writing retreat in Squamish, BC to work on our first-ever artistic collaboration: the play Salesman in China, inspired by Arthur Miller's 1983 effort to direct his masterpiece Death of a Salesman in Communist Beijing. It was rainy and gross the whole time and we caught horrible colds and argued and ate curries out of the freezer for two weeks and also were incredibly productive. We researched and brainstormed and hashed out a massive portion of the building blocks of our play, including characters, themes, theatrical images, and a detailed outline. Nothing about this project so far is anything like the way either of us normally writes. That's what's so exciting about it.